Wearing the right protective gear keeps you in the game. 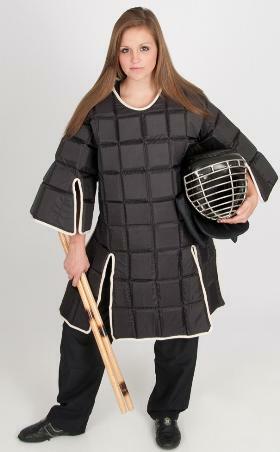 When considering what equipment you will need for protection, don't forget body and chest protectors. 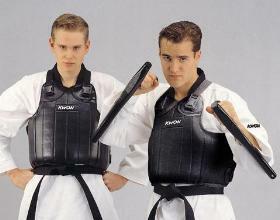 The abdomen and chest are the two largest targets on your body that an opponent will go after. Ribs can get broken, vital organs can get damaged and the wind can easily be knocked out of you when sparring so it is a good idea to cover and protect your abdomen and chest to prevent pain and injury. Quality is of ultimate importance when considering protectors and you will want something that is comfortable as well so you can not feel constrained. I have lined out some of the gear I feel is the best in both fields. 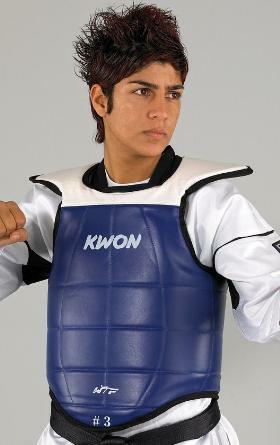 This WTF recognized TKD body protector is made in the all lace reversible style. It is constructed according to the latest WTF rules and features a softer padded area than the Competition Body Protector, making it very comfortable. It is reversible and available with red on one side and blue on the other and comes in sizes extra small through extra large. This is a fantastic body protector in my opinion because it looks cool and does the job too. The outer material is made of a shiny vinyl with foam padding that makes for maximum shock absorption and a great appearance. It has excellent freedom of movement and is anatomically shaped in sections. There are Velcro closures on the back. This body protector is reversible with black on one side and red on the other and comes in sizes extra small to extra large. 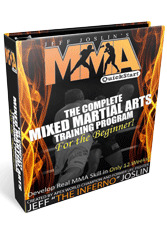 If you are into stick fighting, this is a great choice for you. It is a very durable vest so it can withstand what you will encounter. 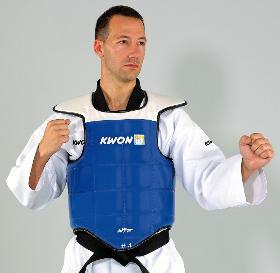 It is designed to protect the upper body all the way down to the thighs and the complete shoulder area as well. Three hook and loop closures at the back of the vest make putting the vest on and taking it off quick and convenient and provides good adjust ability. It is available in black or red and comes in sizes small/medium or large/ extra large. This body protector features a new shock absorbing foam padding that you will love. 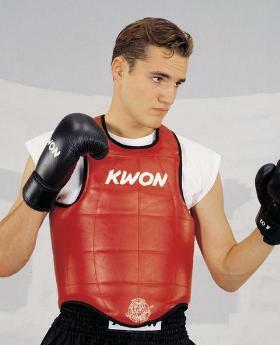 It is WTF recognized too and has a tear resistant vinyl outer fill with shoulder pads built in. The loops are reinforced with extra stitching for added strength and the hook and loop fastening has additional laces ensure that this body protector fits securely. Red and blue reversible, one side is red and one side is blue. Comes in sizes extra small, small, medium, large and extra large. 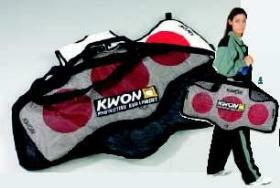 Once you have purchased a body protector, you will want a nice bag to carry it in. This bag is lightweight but very roomy with space enough for one complete TKD outfit which includes a body protector, head, foot, hand and shin guard. The high quality black fabric has great ventilation and is extremely durable. It has carrying handles and adjustable shoulder strap. This body protector has a vinyl front and features heavy-duty lining with a rigid foam insert that gives great damping action. It is anatomically shaped so it is very comfortable and fastens with adjustable elastic straps and plastic snap closures. It is available in small, medium and large. 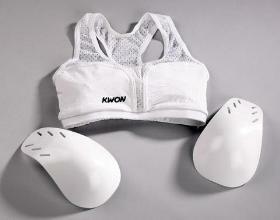 Ladies need extra protection in certain areas and this chest protector by Kwon has that problem covered. Breasts, ribs and sternum are all protected with a very flexible but extremely strong polyethylene guard. Polyethylene is a type of plastic that is used for packaging, in shoes and various other products that require strength with flex. It is stretchable, made of hi tech two way stretch of 86% tactel, 4% nylon and 10% lycra. It allows movement of moisture to speed evaporation so the body can cool naturally. When a bra is worn under the guard, it is recommended it be made of a synthetic fabric. The Maxiguard comes in extra small, small, medium, large and extra large. 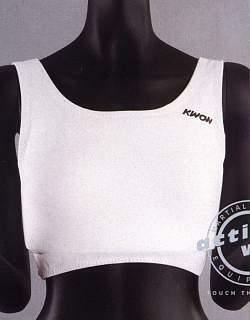 For a great fitting, comfortable bra, I recommend this one that is made from Tactel/Lycra. It is "cool n" dry comfort" so you can focus on your training and has a double thickness pocket over each breast to hold the shaped plastic inserts in place firmly. The inserts can be removed easily while Cool Guard is being worn and do not actually touch the body when worn. They are constructed of soft but very strong Polyethylene and go around the under arm for extra protection and to keep the inserts in position. Available in sizes extra small through extra large.